A red-lacquered bridge across the Daiya-River. 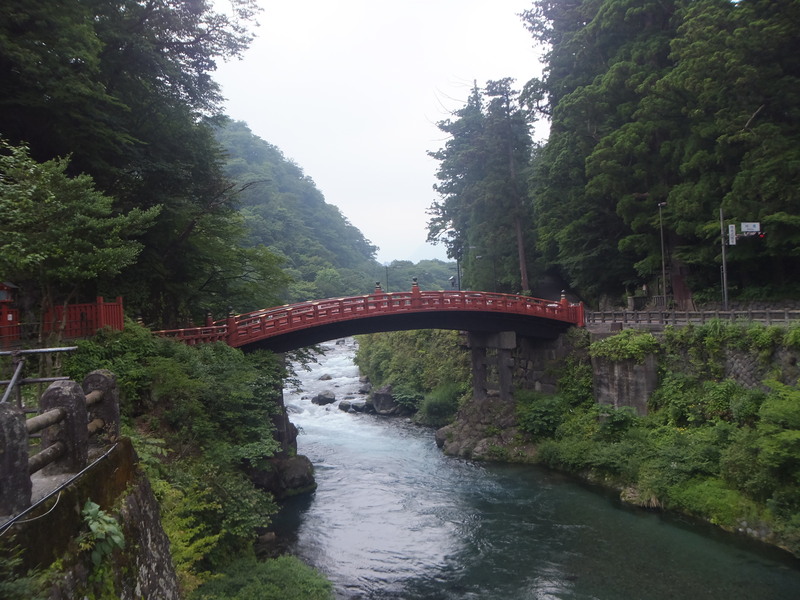 They say that Priest Shodo, the founder of Nikko, first crossed the fast flowing river on the back of huge twisted serpents by the help of a god, Jinja-Daiou, in the 8th century. This was the legendary first bridge. The current bridge, originally built in the 17th century, dates back to 1902. The scene of the red arched bridge over a swift blue flow against greenwoods is picturesque! A temple of the Tendai sect of Buddhism. 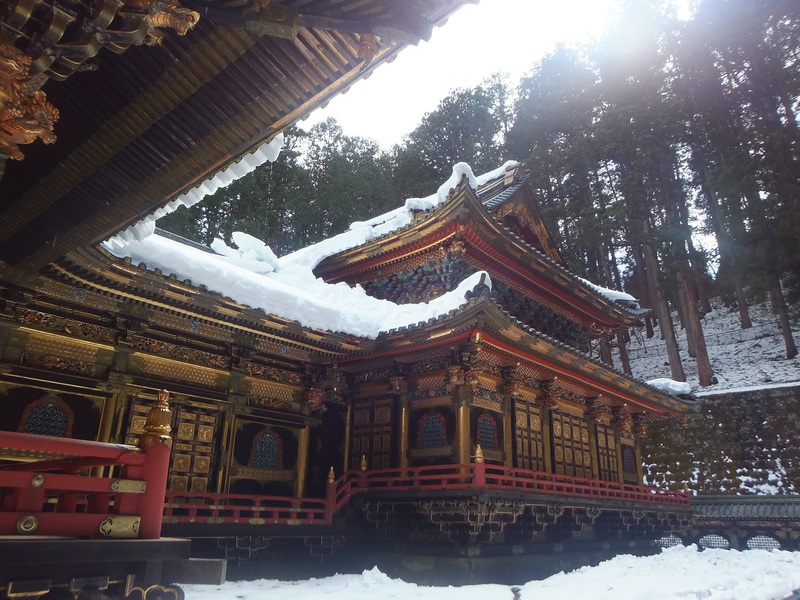 Priest Shodo, the founder of Nikko mountain worship, established the original temple in the 8th century. It developed into the huge temple complex it is today in the 17th century. 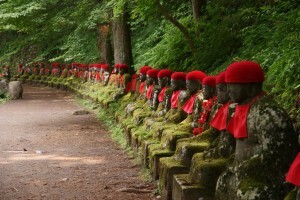 It had been a religious headquarters in Nikko. The main hall is under renovation until 2020; however, it is possible to see some artifacts and to walk around the construction site. 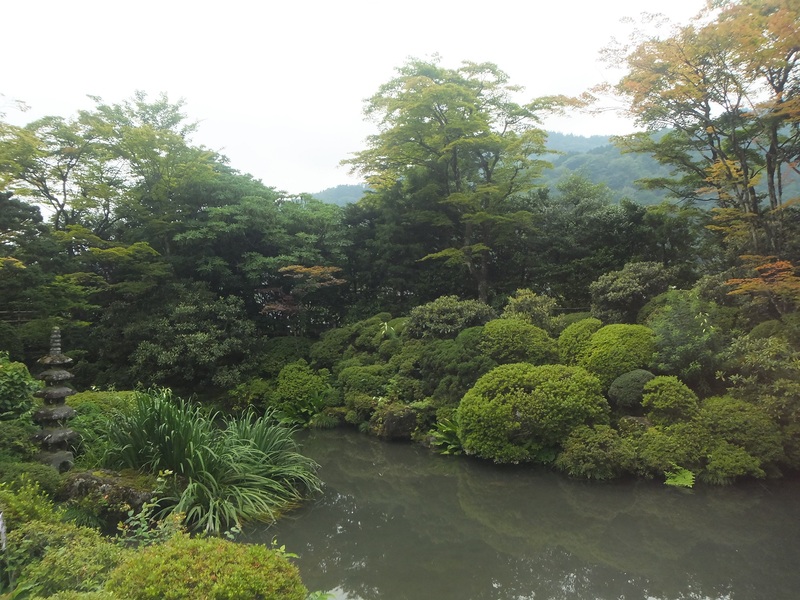 A strolling garden in Rinnoji temple, with paths winding around a long central lake with mountains in the background, created over 300 years ago. It displays a different kind of beauty with each different season; however, autumn is stunningly beautiful. 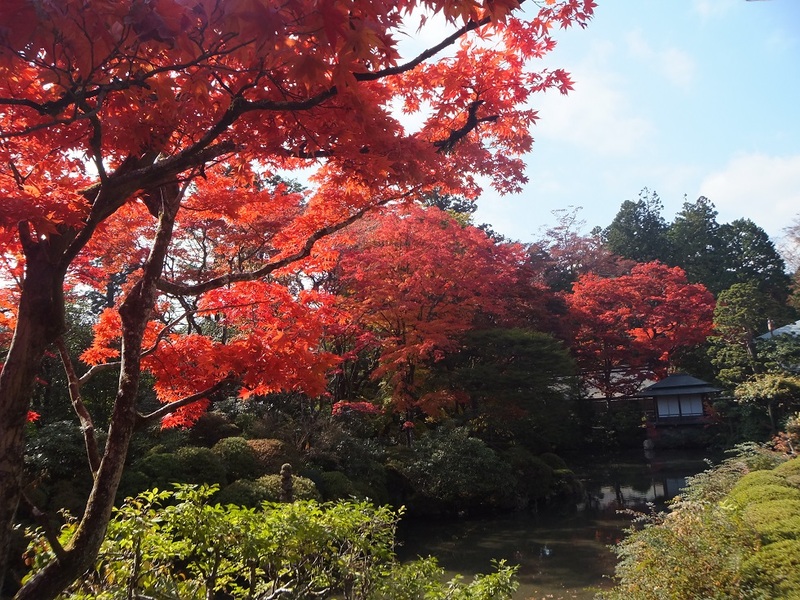 We can admire almost all of the kinds of maple leaves found over the Nikko area, in this garden. 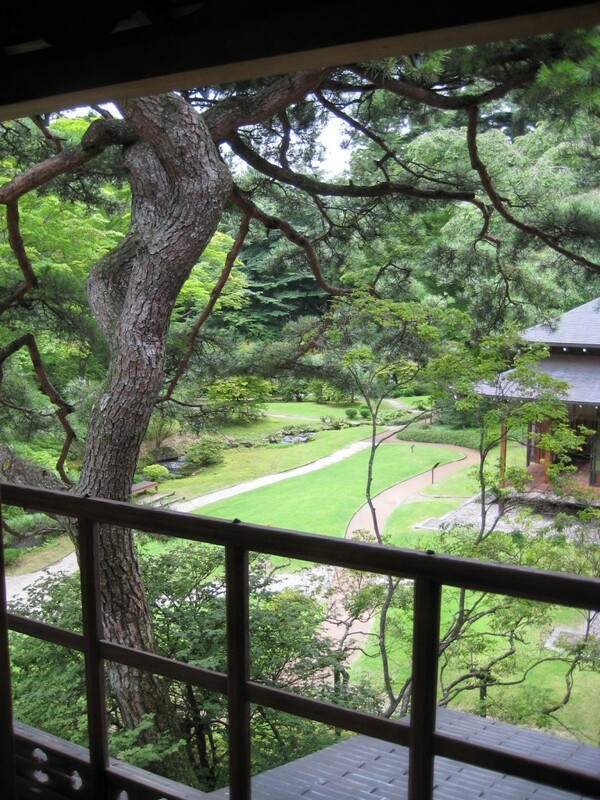 It is a masterpiece of landscape gardening. The huge mausoleum of Tokugawa Ieyasu, the first shogun of Edo period. The beauty of the landscape, composed of richly decorated structures with colorful and intricate carvings, is overwhelming. The construction of the shrine, using the best artists and artisans of the day from all over the country, was completed in 1636. A high level of authenticity has been maintained well through periodic restoration works following the original plans and techniques. Renovation on the Yomeimon-gate, started in June 2013, was completed in March 2017. 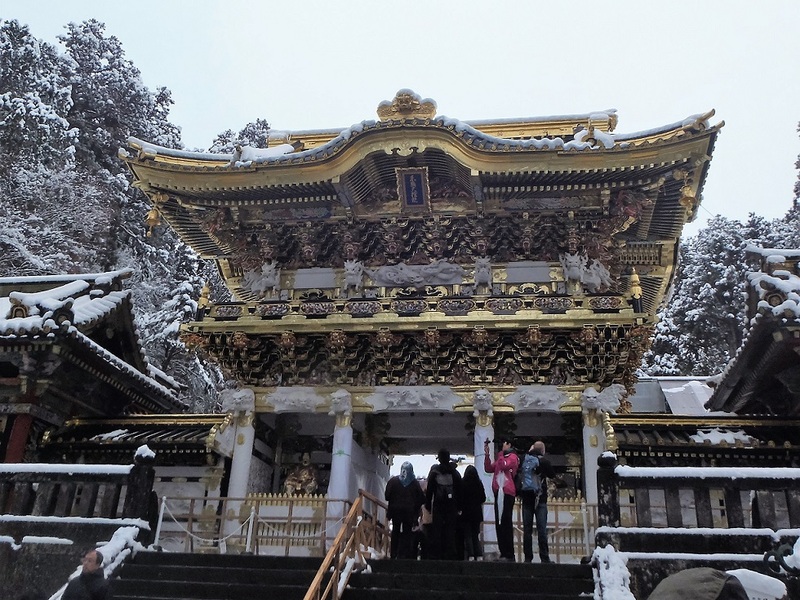 A remarkable feature of the Toshogu-shrine is its numerous carvings (more than 5000 pieces), including animals, plants, fish, birds, flowers, vegetables, people and so on. 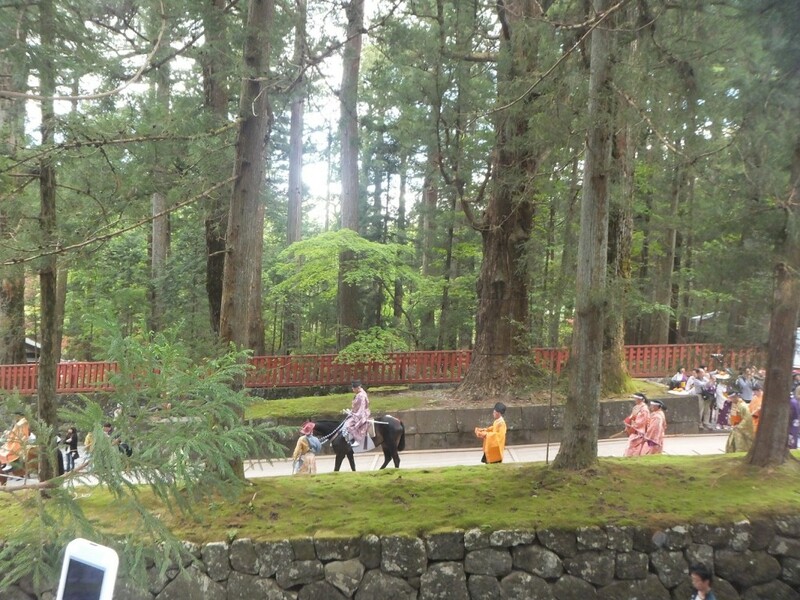 The Toshogu-shrine embodies prayers for nature and eternal peace! 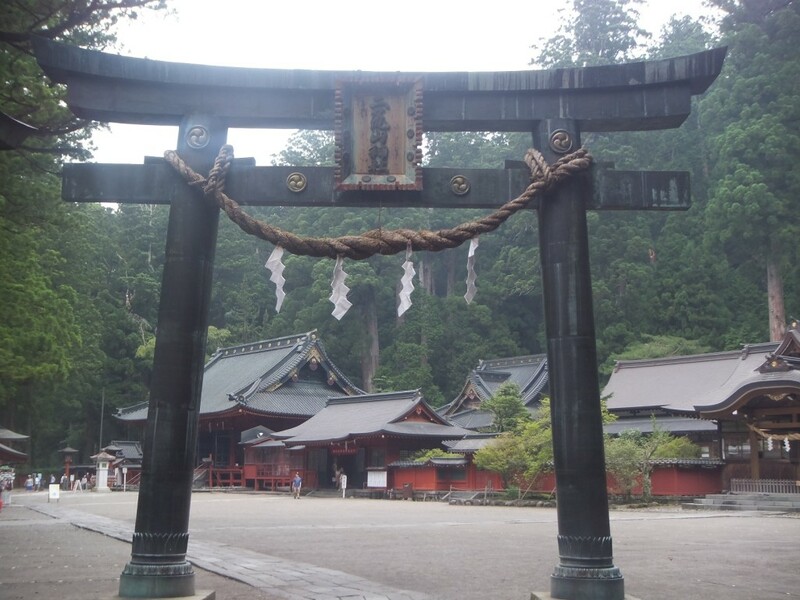 A Shinto shrine, dedicated to the deities of Nikko’s three sacred mountains, founded in the 8th century by Priest Shodo. This shrine has played an important role as the center of mountain worship. 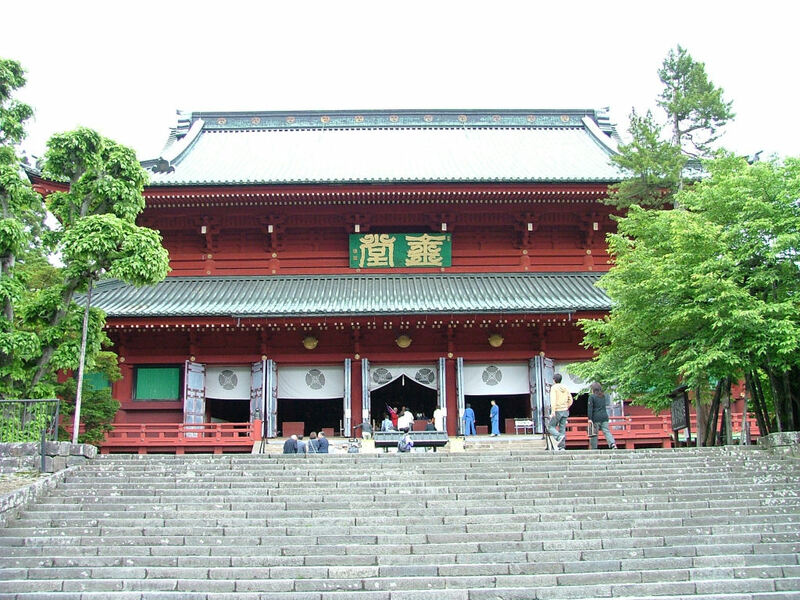 Today this shrine is very popular for several power spots relating to good encounters, especially among girls in love. “Parents and child cedars” whose roots are intertwined, and “husband and wife cedars” are worshipped as sacred trees by those who pray for a good encounter, the well-being of one’s family, or being blessed with a child. 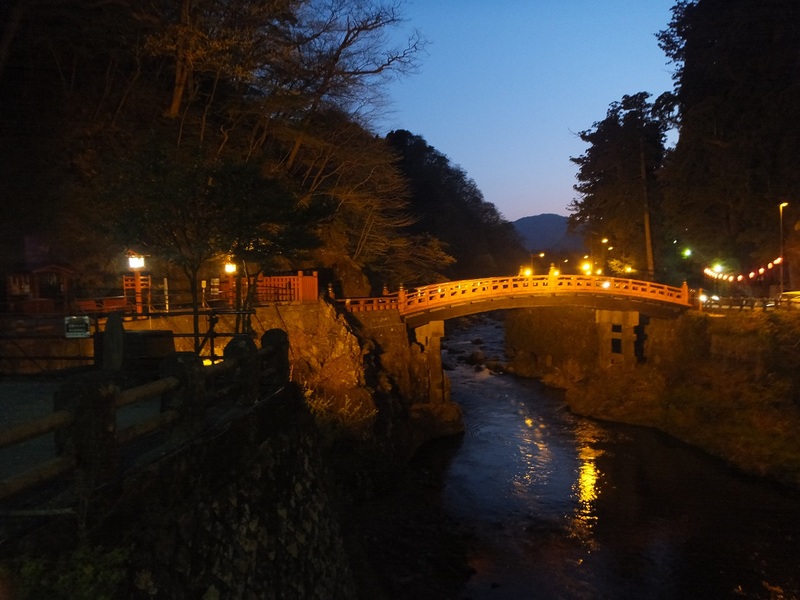 In the back precinct, there is a sacred pool of spring water, which is believed to be effective in improving one’s IQ, rejuvenation and making tasty ”sake”.. Nikko is famous for its pure water. The mausoleum of Tokugawa Iemitsu, the third shogun, the grandson of Ieyasu. According to Iemitsu’s wish it was built smaller in size and more modestly than some. However, as improved methods were applied in construction and decoration, this mausoleum complex is generally considered artistically superior to his grandfather’s. Set in a dense forest, it has a number of elaborate gates, which lead to the main building covered in gold and featuring beautiful carvings. To those who love a quiet and sacred atmosphere, but still adore gorgeous surroundings; this is a must see! Nikko Tamozawa Imperial Villa was built in 1899 for Prince Yoshihito who became Emperor Taisho, and used as a retreat for emperors and princes up until 1947. Restored in 2000, its excellent Japanese artisanship in the architecture and superb Japanese interiors are open to the public. Unlike Imperial Palace in Tokyo, all visitors are allowed to walk inside the residential space where the present emperor stayed for evacuation in 1944 and 1945. The garden is beautiful. The weeping cherry in spring is breathtakingly gorgeous! The small, but dynamic gorge formed about 7000 years ago. This unusually beautiful area, with limpid waters and large lava formations has been a sacred spot since ancient times, and was a training center for Mountain Buddhists. Around 70 stone statues of Jizo, the Buddhist guardian deity of children, line the riverside path. A quiet riverside walk in a religious atmosphere is impressive and unforgettable! 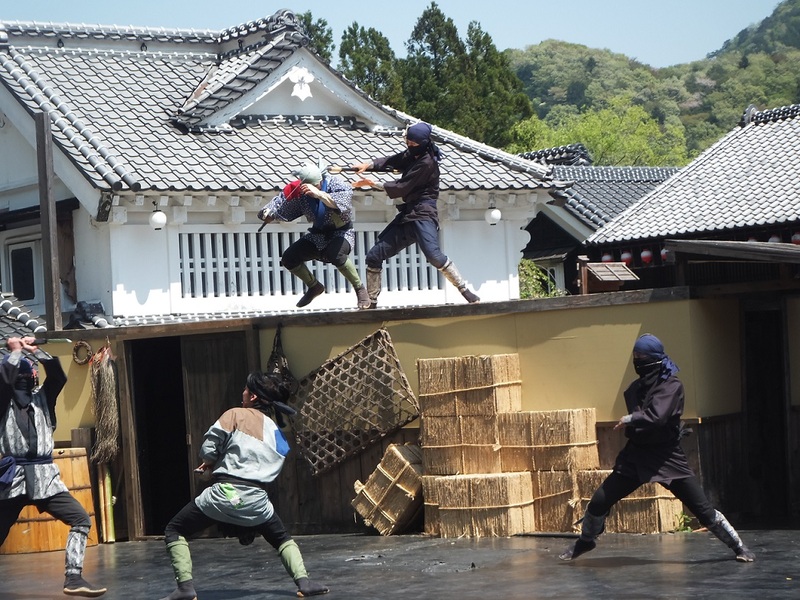 A Japanese culture theme park based on the Shogunate period, making you feel as if you were wandering around a samurai movie set. The exciting Ninja show, the water magic theater, flamboyant Geisha parade… It has many more features that are dynamic. Located in beautiful surroundings, this amusement park is attractive especially for a group with children! The Yabusame or horseback archery is a Shinto ritual which was employed by the Shoguns as a military training exercise. The Nikko Yabusame involves nine archers in two groups, whose individual task is to hit all three targets spaced 70m apart along the Omote-Sando while mounted on a horse galloping at full speed uphill.